Details for each CTA below. 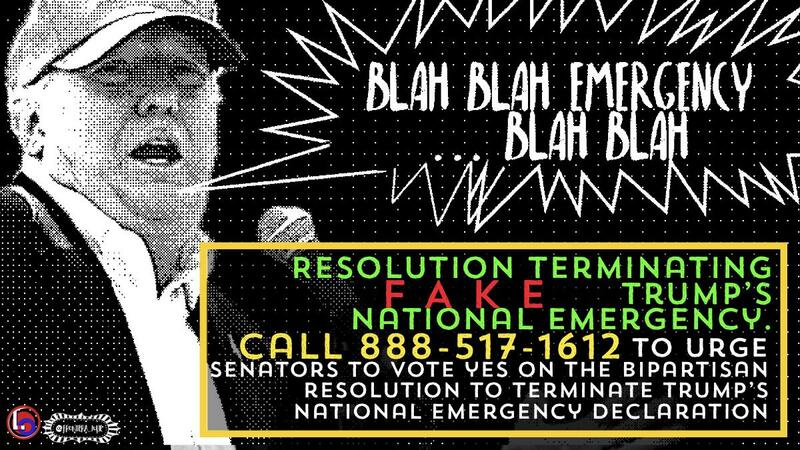 The resolution to terminate Trump's #FakeNationalEmergency now heads to the Senate. Every senator should be putting country over party and opposing this dangerous move to cede more power to Trump — and yours need to hear from you. 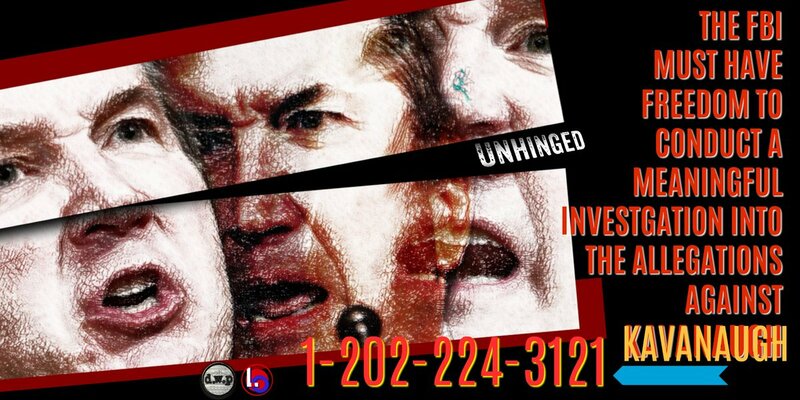 Call now: 888-517-1661. 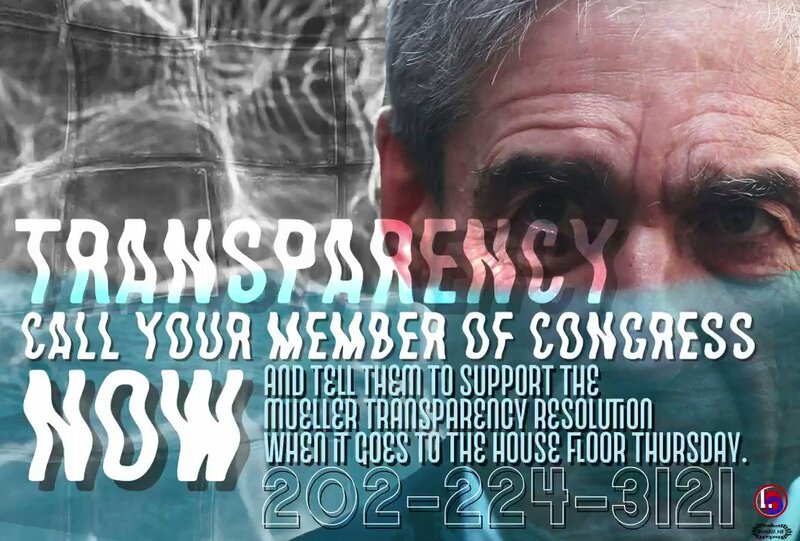 House Dems will vote on a resolution calling for the public release of the #Mueller report whenever the special counsel finishes his work. 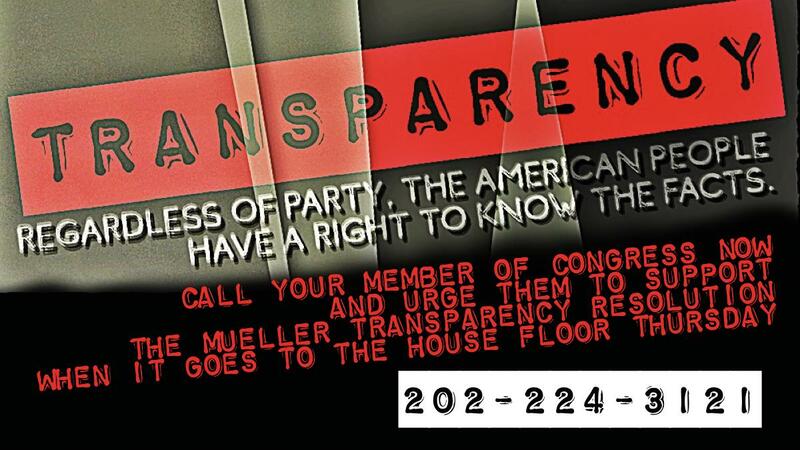 Call your MOCs NOW & urge them to support the Mueller #Transparency Resolution when it goes to the House floor on Thursday, (202) 224-3121. 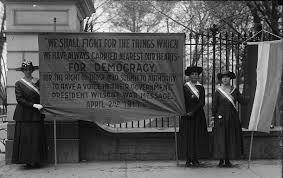 We have until April to #RatifyTheERA in Az, good news is we have the votes, all we need is YOU! 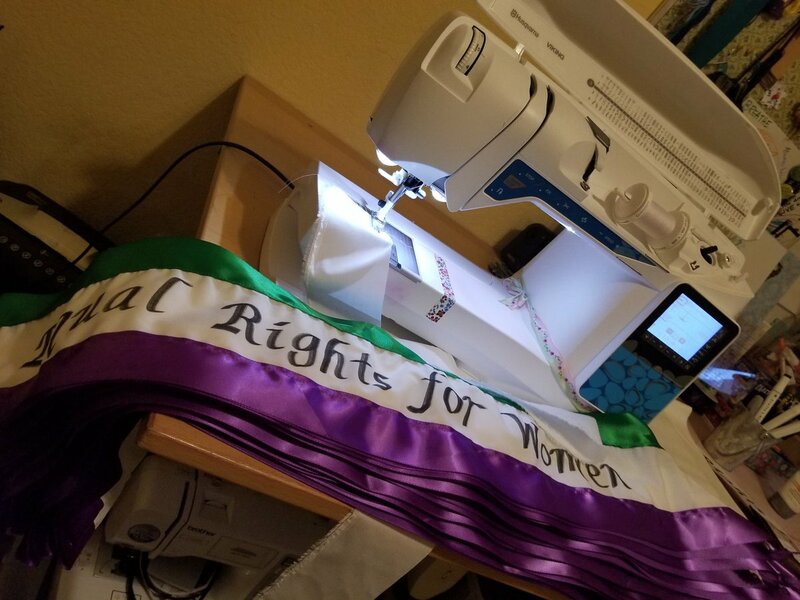 If you cannot attend the #38Miles march, you can sponsor someone! 🚨Important #CallToAction 🚨 This move to #ImpeachRosenstein won't pass, but Trump will use this as an excuse to fire Rosenstein. EVERYONE, but especially those with Republican MoC's - call them NOW, and tomorrow, and the day after that! When Trump tries to fire Rosenstein, we march. Make sure you're signed up for rapid response alerts to march peacefully. Protest peacefully. Violence gives Trump an excuse to declare martial law. #PeacefulProtest is the most effective strategy. URGENT #CallToAction: Given events at the #TreasonSummit, the near future (before Labor Day) will determine if Trump successfully destroys the #Mueller probe & escapes justice. Time to get focused. Follow these 4 steps to be useful. 1. Call your 3 MoCs! 2. Sign up for Wednesday night's candle-light vigils for the #RuleOfLaw, even if you have to change your plans or drive a distance. Visit ConfrontCorruption.org to sign up. 3. Sign up for TrumpIsNotAboveTheLaw.org. 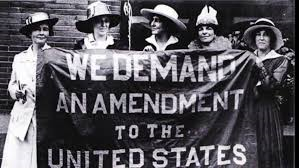 When Trump crosses a red line by firing Rosenstein or significantly hampering Mueller's probe, we will take to the streets in non-violent peaceful protest. When we created The Loyal Opposition, we began with a non-partisan #CallToAction operation. Our mission has changed as our country's slide towards autocracy accelerates unchecked by the GOP. 1) We are now explicitly partisan. 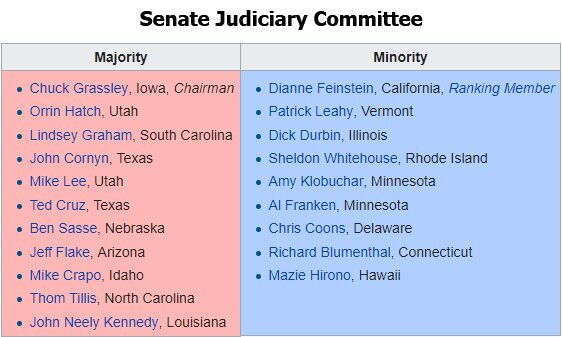 Democrats MUST win the #DemocracyReferendum in November. 2) Our focus has shifted to the Russian information war, election education, & ad hoc CTAs that support our mission. Please read our revised mission statement for full details on our updated mandate. We remain a grassroots funded organization and are grateful to our followers for the trust placed in us. 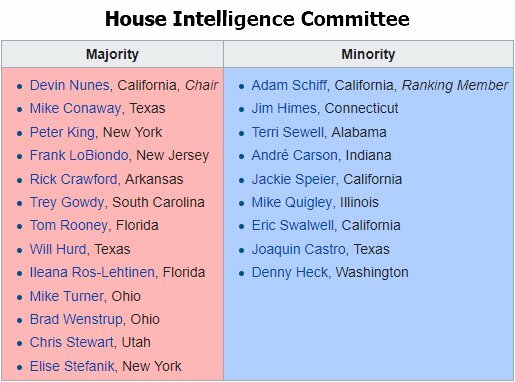 Members of Congress controlling the committees investigating Russian interference & #TrumpRussia collusion have selectively leaked information intended to damage the credibility of key witnesses. We deserve to hear the full context. We were the difference then & we can be the difference again here. On Tuesday, Republicans cleared a hurdle w/their #GOPTaxScam bill by getting it onto the full Senate floor. Every 📞 & 📧 counts. The Senate Budget Committee voted on Tuesday to send the @GOP tax bill to the full floor and a vote could occur as early as Thursday. *45 & friends took off for TG ⛳️🦃 but they are set to return to push the #TrumpTaxScam. House Republicans have passed tax legislation and the Senate now is considering a bill which a bipartisan analysis projects would immediately raise taxes for almost 14 million middle income Americans. #Mueller’s investigation is moving into a new phase with the first indictments expected as soon as Monday. 10/27 ☎️ #CallToAction: Puerto Rico continues to receive sub-par treatment from Washington. Call & demand a 1-year #JonesAct waiver to help. #PuertoRico’s infrastructure has been decimated, leaving many citizens without electricity, clean water and food. 10/26 ☎️ #CallToAction: Alexander-Murray is the last hope for saving #ACA. It's bipartisan & a win for consumers. Let's get it to the floor. *45 is following through on his threat to sabotage #ACA by withholding CSR subsidies & slashing enrollment outreach. 10/5 ☎️ #CallToAction: Russia's threat to our election systems is real. Please support S.1821 to create an independent commission. 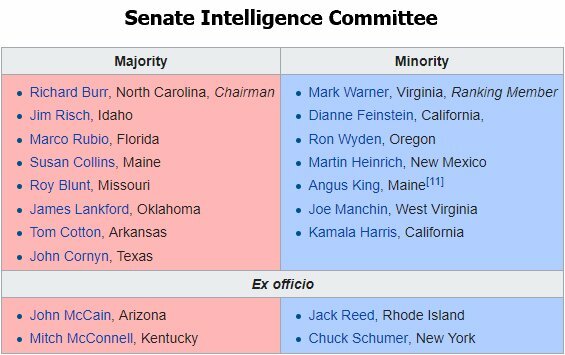 Sen. Intel Cmte. acknowledged Wed. that Russia🇷🇺 interfered in '16, including w/our election systems & it continues.